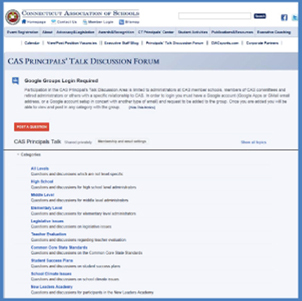 One of the highlights of the recently redesigned CAS website is the “Principals Talk Discussion Forum,” a place where member school administrators can pose questions to their colleagues and hold rich online discussions on a variety of subjects directly related to their positions. To participate, click here and request membership in the group. After doing so, you will be able to post new topics and reply to those posted by others. Sign up now. The more people who participate, the better the conversations will be!